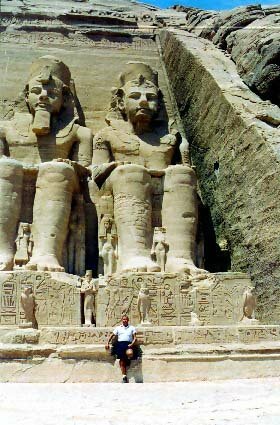 Here I am standing in front of the giant statues of Ramses II in the Nubian Desert after having left Aswan on an older 737 which had the seats moved so there were about 12 so inches of space between the rows! The arms were about two inches wide and we were crammed into the plane. The flight was only about an hour so not too bad. Landed at Abu Simbel and took a small bus around the back of the artificial hill where the inside of the temple was situated after being moved because of the dam. As we stopped we saw about a 100 Japanese tourists in front of the temple complex. The tour guide said not to worry. They had just gotten out of their bus and were running around taking pictures and talking away. Here and there, a picture here, a picture there. After half an hour onto the bus and that was that. We couldn't help but laugh. They would spend time at home looking at the pictures of where they were, not looking at what there was to see on the spot. Now there were only we 18 people and we spent almost four hours viewing the temples. You also can go into the artificial hill behind the temple and see the steel bracing and concrete used to create the fake hill. Very interesting. We were lucky as the temperature was about 80 degrees, they said in the summer it gets up to 120 degrees. Back on the plane to Aswan but they didn't let us get off. We had to sit there almost an hour, no air conditioning or drinks. Then we flew to Cairo, so cramped my knees were in my face. Guess what, they served us a box lunch! Every seat was taken, the only flight to Cairo so full of tourists and Egyptians. We tried to eat and drink while bouncing around in the air and bunched up like cattle in a box car. Needless to say, as we landed in Cairo, everyone breathed a sigh of relief, off to the hotel and a shower. Of course everyone always says, "Aren't you afraid to travel to places like Egypt?" Well after we got back in the late afternoon and everyone had showered, we met for a cocktail in the hotel lounge. Everyone must have turned on CNN news. We hadn't heard much news for over a week and what did we hear, two German tourists killed in Florida, drive by shooting (4) in L.A. Murders in New York, murders in a post office and so on. We have more murders in one week than they do in a year. Probable more murders in a day than they do in a week. Actually a funny story happened the last day we were on the boat. A new group of tourists got on and that night at dinner, one woman asked us how our trip was and if we felt safe. We all said we had a wonderful time and felt as safe as anywhere. The next morning she came down to breakfast in a glowing orange jump suit. I said, "When you are on the top deck and the sun hits that orange jump suit, the 'glow' will be seen miles away." She said, "That's true, but I have always wanted to see Egypt so what ever happens, happens. I might be Cleopatra in my next life so might as well look good!"